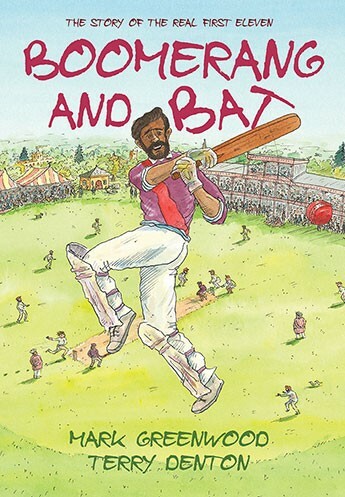 The Boomerang and Bat by Mark Greenwood is a children's book about the first Australian cricket team to tour England, a group of Aboriginal stockmen. In 1868 a determined team of Aboriginal cricketers set off on a journey across the world to take on England's best. Led by star all-rounder Johnny Mullagh, and wearing caps embroidered with a boomerang and a bat, they delighted crowds with their exceptional skill. From the creators of Jandamarra, this is the remarkable story of the real first eleven. Author bio: Mark Greenwood's award-winning books examining history, myths and legends have been honoured in Australia and internationally. Simpson and His Donkey was a CBCA Honour Book. Jandamarra, illustrated by Terry Denton, was shortlisted for the CBCA Eve Pownall and the NSW Premier's Literary Awards. Mark often teams with his wife, illustrator Frane Lessac, to produce books that promote history as well as an understanding of multicultural issues. Terry Denton is one of Australia's busiest literary creative forces and his work as a writer and illustrator can be found in popular children's titles such as the Gasp! books, Terry Denton's Bumper Books and the Wombat and Fox stories. His work with writer Andy Griffiths on the Just! books and the epic Treehouse series is universally loved.